It's never too early to start thinking about Spring Break! 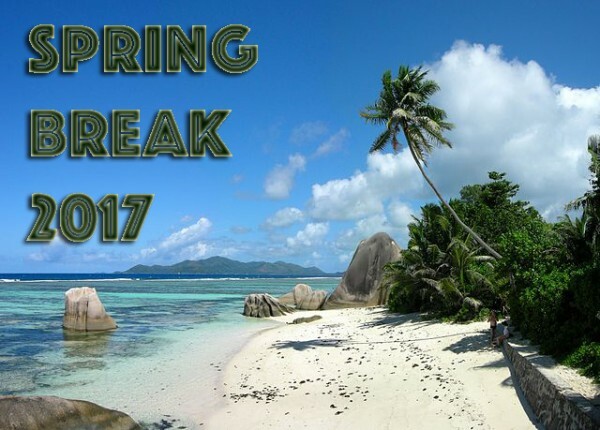 Spring Break 2017 is Sunday, March 12 - Saturday, March 18. During this time, I have suspended regular shifts. You are free to go somewhere and have an awesome break! If you do decide to stick around, I have a limited amount of shifts that are up for grabs that week. Take a look at the calendar and let Kelci know if you want to claim any of them. She will collect responses until the end of February and then assign those shifts. If you have Spring Break plans and need to miss work on Saturday, March 11 or Sunday, March 19, just let Kelci know but you probably don't have to find a substitute for yourself. I'm (hopefully) off to Vancouver to visit some friends for Spring Break so I won't be signing up for any of the available shifts. Not sure if I'll be going anywhere for Spring Break, but I'll let you know before the end of Feb!! Will let you know if/when I make plans before the end of Feb!